Offsite — request before 2:30 pm on weekdays and the book will be delivered the following weekday, requests for scanned electronic delivery are usually filled by the next business day. Borrow Direct — books will be delivered from partner libraries within 3-5 working days. It is the fastest way to get books! 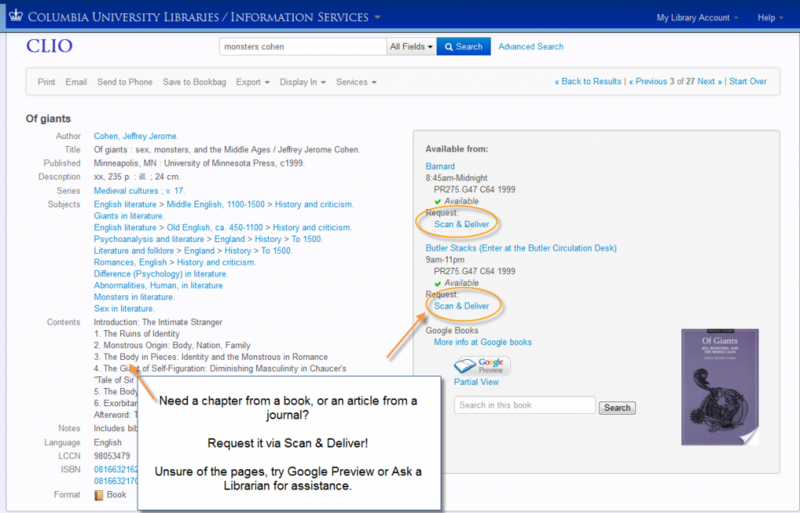 Scan & Deliver — scanned copies of articles or chapters from selected Columbia libraries are delivered within 2-3 days. Requests must conform to Fair Use guidelines to be in accordance with copyright law. ILL (Interlibrary Loan) — for articles, DVDs, microfilm and other non-book items, articles come quickly, books can take 1-2 weeks. For fastest results, include ISSNs or ISBNs. 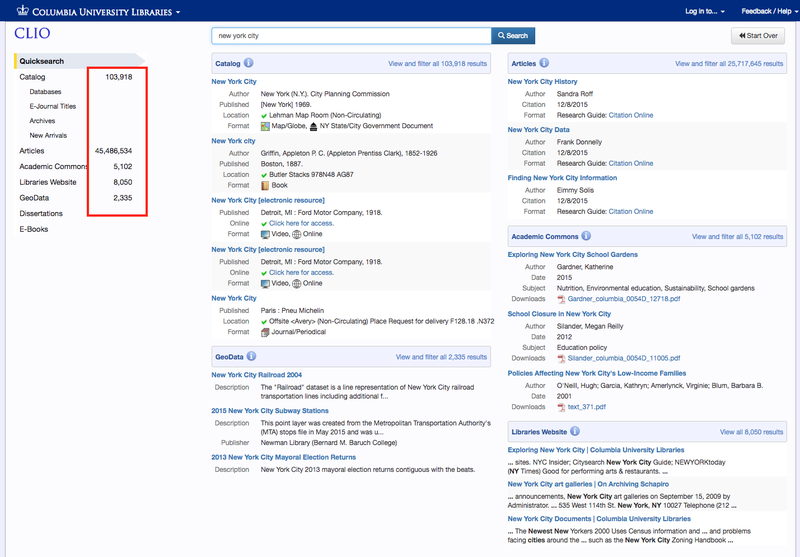 Precataloging – items with a Precataloging location are often available the same day. Recall/Hold – Recalls usually take 2 weeks, try Borrow Direct first. Holds may take several months and should only be used when Recall is not available. Inter-campus Delivery — Request delivery of items from the Health Sciences campus to Morningside libraries and items from the Morningside campus libraries to the Health Sciences Library. Items are usually delivered in 3-4 workings days. Item Not on Shelf? — Request a search for an item not found on the shelf. If found, it will be held for the requester. if the item is not found, it will be charged to missing, enabling borrow direct requests, and will also enter the replacement queue. Items are usually searched within 24 hours. 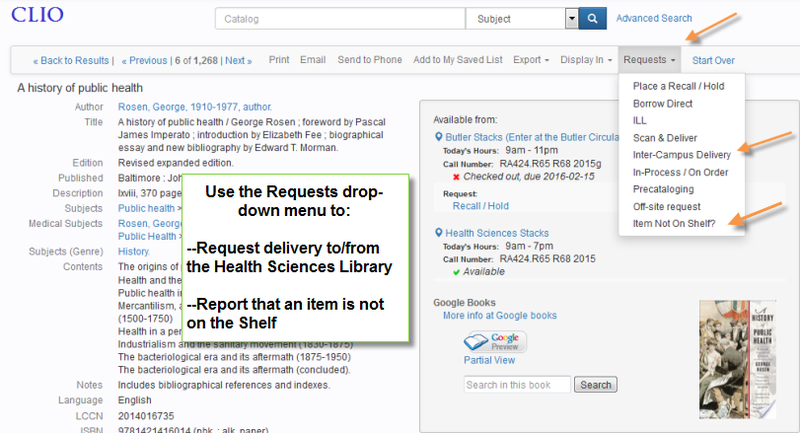 You can also use the Requests tab to place Scan & Deliver requests when the pages you need are not available at Offsite. This entry was posted in Features, News on November 3, 2015 by Sarah Witte. 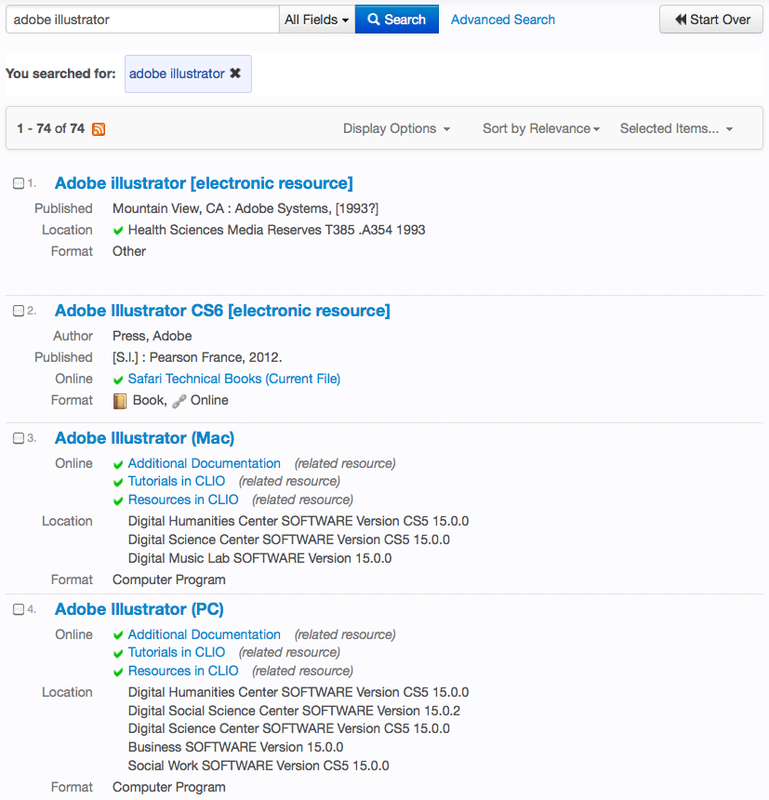 The Digital Science Center also provides links to finding software available there on its software page. 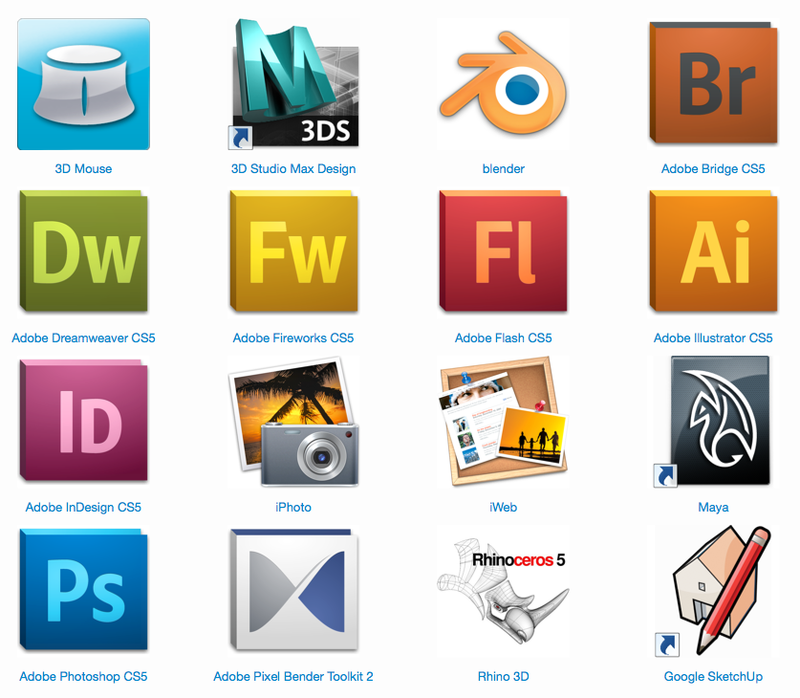 All of the icons on the software list are links directly to the software in CLIO! This entry was posted in Features, News, Search Tips on May 6, 2014 by Jeffrey Lancaster. Links to full results labeled “View and filter” to promote facets. Enhanced visibility for database records and a clearer label to Search Database. Ask a Librarian service at point of need. 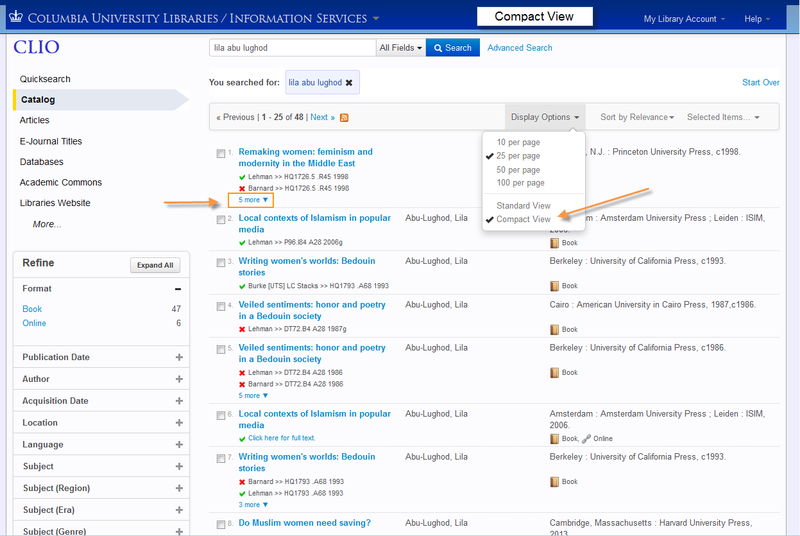 A no hits search will display the Ask a Librarian chat widget. 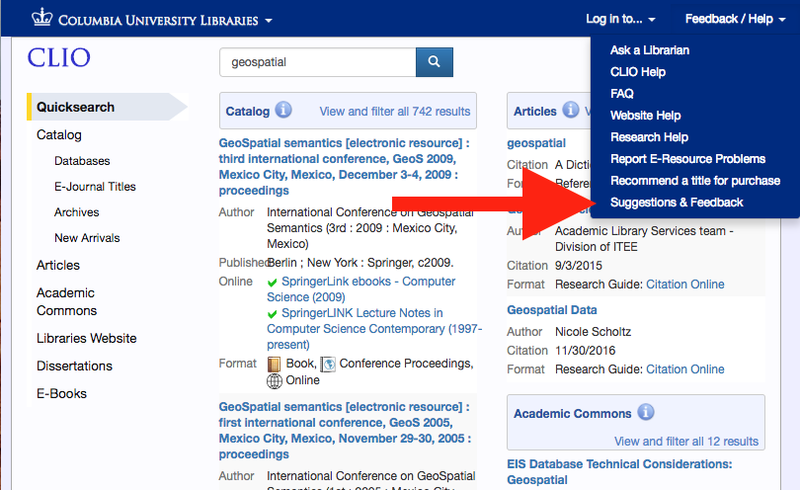 Refine options (author, library location, publication date, subjects, language, call number) in left sidebar are now sticky. When opened, they will remain open between searches until closed. 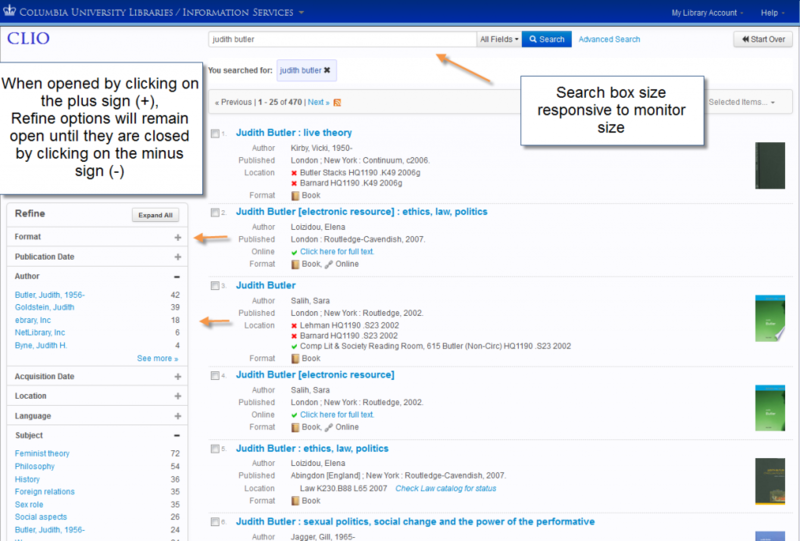 The search box size is now responsive and will be larger on wider displays. Please see the release notes for a full list of changes in CLIO 7.9.25. We welcome comments and suggestions for improving CLIO. Your feedback is invaluable as we develop the interface. Please comment below, use the Suggestions & Feedback form under the “Help” menu in the upper right corner of CLIO, or Ask a Librarian. This entry was posted in Development, Features, Release Notes on April 11, 2014 by Sarah Witte. 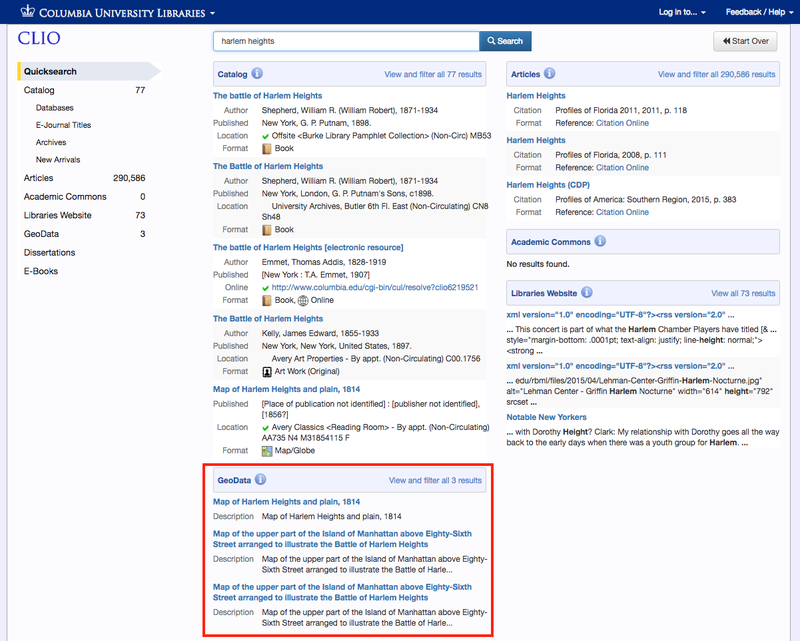 Would you like to know when the library adds new titles in your area of interest? Create an RSS feed from any CLIO search using the RSS icon , and add the feed URL to your feed reader or blog. 1. 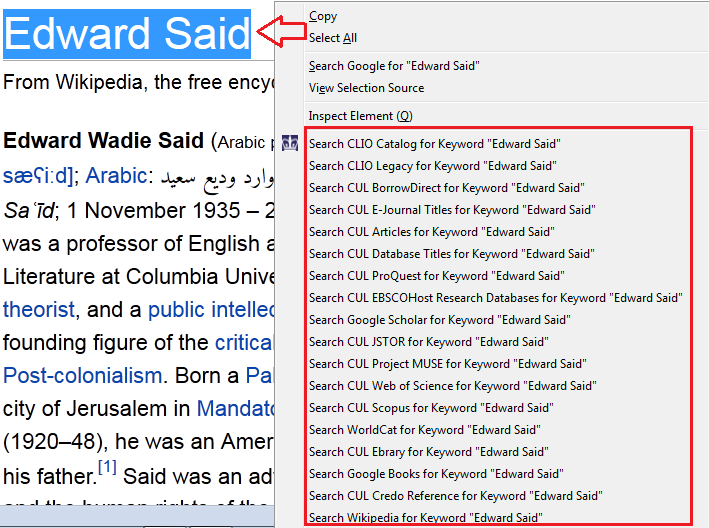 Enter any desired search terms in the CLIO search box. Use the asterisk for all possible endings: cartoon* finds cartoon, cartoons, cartoonist, etc. Leave the box blank if you are not interested in searching for specific terms. Press search. 2. 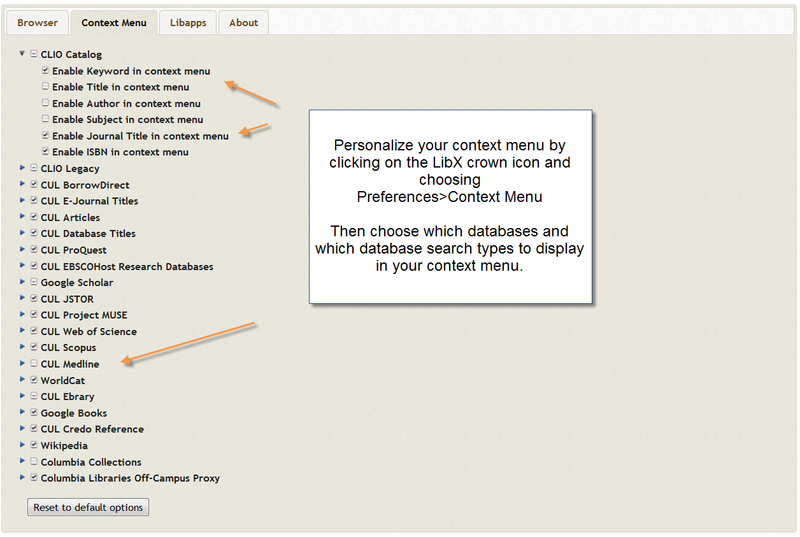 Use the “Refine” options on the left side of the results to narrow your search. If you’re only interested in newly published and acquired material, narrow by publication date (say 2013-2014) and by acquisition date (options are within 1 week, 1 month, 6 months, 1 year). Other options include limiting by format (book, video, music, etc.) library location, language, subject, subject genre (this is especially useful if you would like to include or exclude fiction) and call number. 3. Sort the results by acquisition date, this will ensure that your feed is refreshed with the latest titles. 4. Right click on the RSS icon , and copy the link address. Paste the RSS link address into your feed reader, or blog (using the RSS widget). 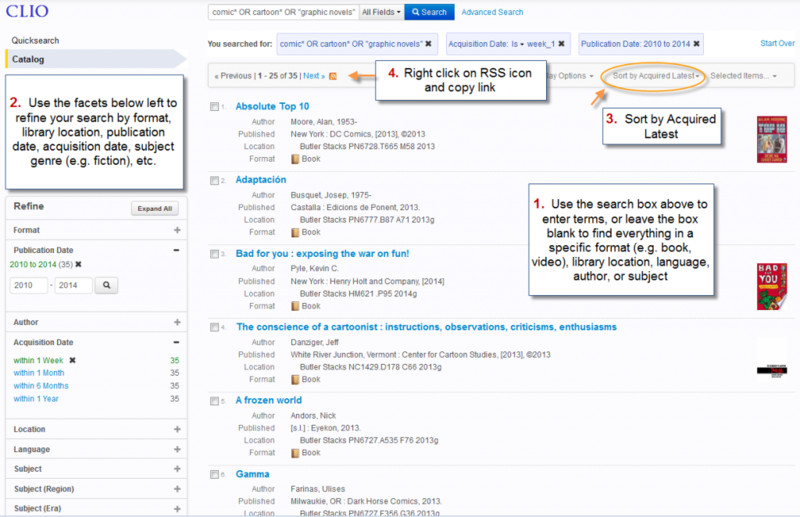 Need help creating your search, or have a question about creating an RSS feed? 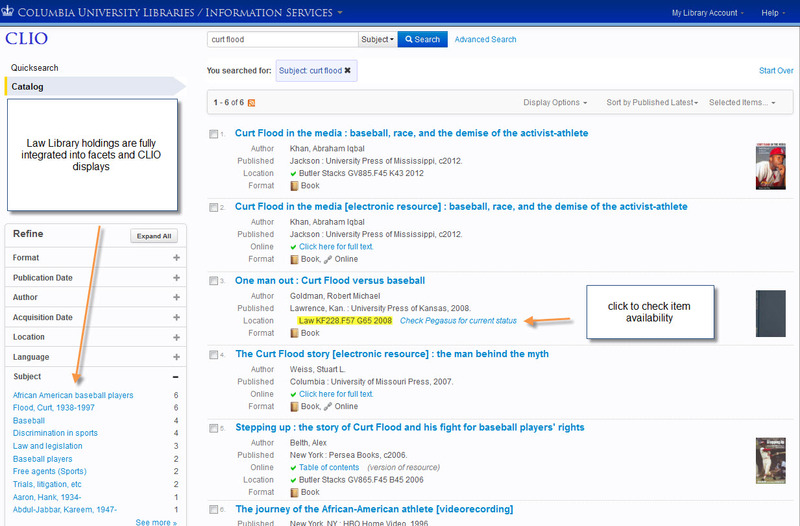 Ask a Librarian using the box above right, contact your subject specialist, or use the feedback link under “Help”. Looking for a feed reader to replace Google Reader? We like Feedly. Here are some other recommendations from LifeHacker. This entry was posted in Features, Search Tips on February 27, 2014 by Sarah Witte. With the latest CLIO release, 439,141 bibliographic records from the Columbia Law School Library catalog have been loaded into CLIO catalog. Researchers in a variety of disciplines such as human rights, history, gender, international relations, and early church history can now find relevant material without checking each catalog separately. Use the “Check Pegasus for current status” links to see if a title is checked out. Law is now the fourth largest collection in the catalog after Offsite and Online (each at 2.6 million) and Butler Stacks (1.07 million). This is the first of what we expect will be a series of important additions to our catalog. Thanks are due to Kent McKeever and Law Library staff who made this possible as well as to the Spectrum team — Gary Bertchume and Stuart Marquis in particular. This entry was posted in Features, News, Release Notes on February 7, 2014 by Sarah Witte. If you have a question about searching CLIO, please comment below or use the Suggestions & Feedback form under the “Help” menu in the upper right corner of CLIO. Or, Ask a Librarian. This entry was posted in Development, Features, News on December 5, 2013 by Sarah Witte. 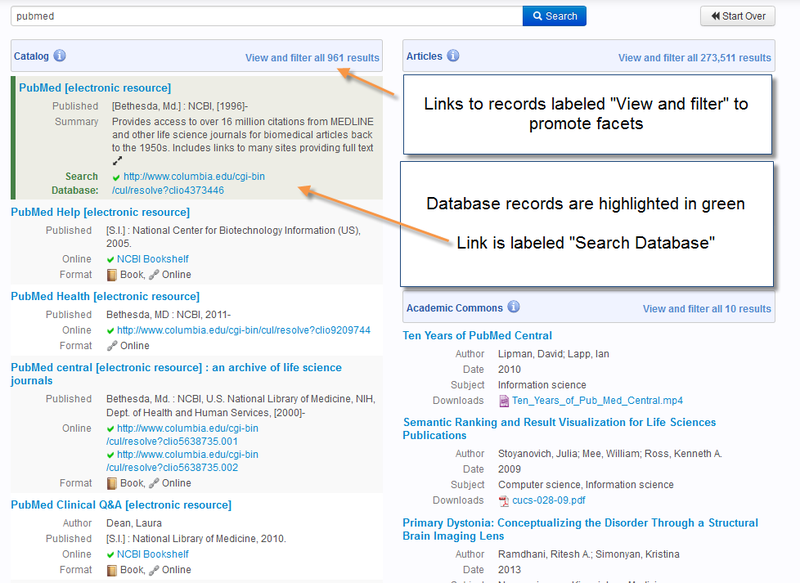 Highlight text on any web page, right-click to display the context menu, and choose to search that text in a number of databases, including: CLIO, CLIO Legacy, Borrow Direct, Worldcat, ProQuest, Ebsco, Scopus, Google Scholar or more. If you have a previous version of CUL LibX or another LibX, this installation will overwrite it. For more information about LibX see our LibX Page, send email to widget-help@libraries.cul.columbia.edu, or Ask a Librarian. This entry was posted in Features, News on October 17, 2013 by Sarah Witte. Need a book chapter or journal article from Columbia’s collections? Scan & Deliver: Electronic Document Delivery enables Morningside/Barnard/UTS faculty, students, staff, and Provost-appointed visiting scholars with library borrowing privileges to request electronic delivery of articles and book chapters from the general print collections of many of Columbia’s Libraries. 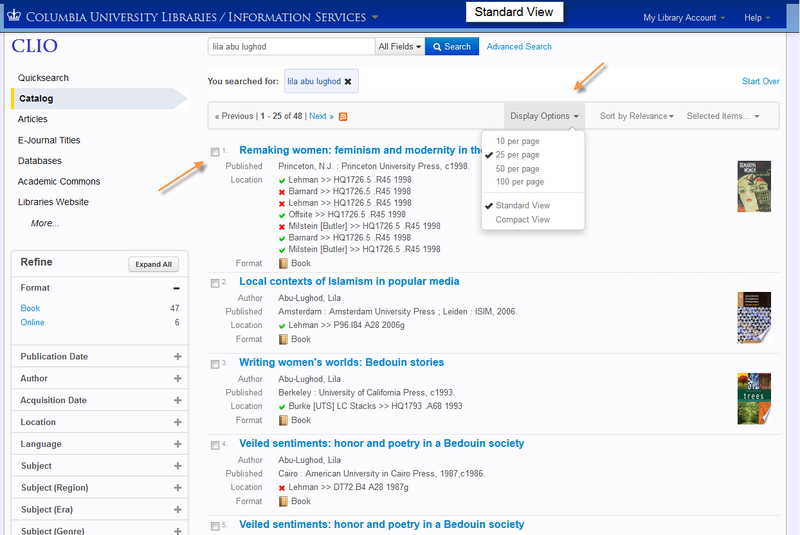 The service is available for book chapters and articles in the general print collections, with some exceptions. Run a CLIO search for the book or journal you’re looking for. Select “Scan & Deliver” from the Request options below the library location. Follow the instructions and submit your request. 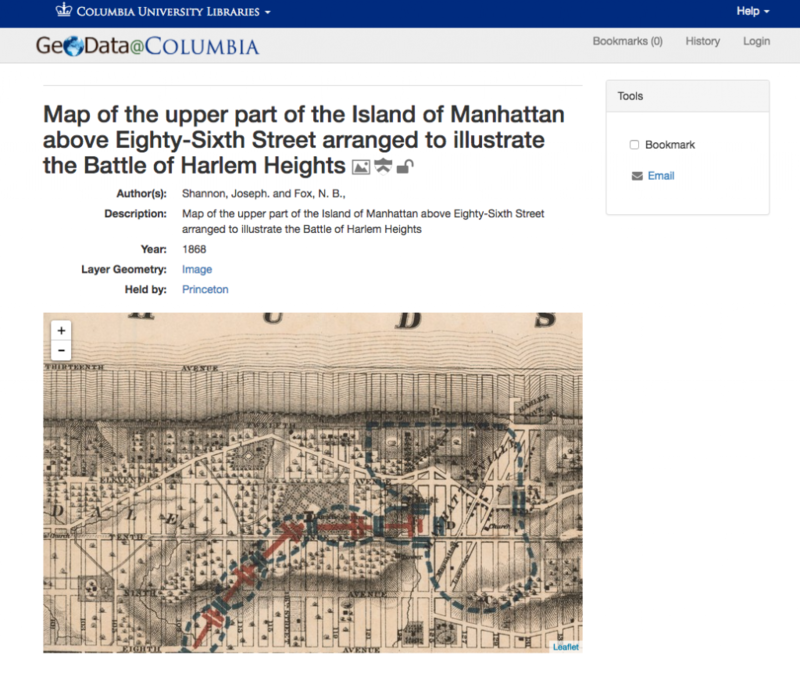 Visit the Scan & Deliver web page for information on which Columbia University Libraries participate in the service, detailed instructions for placing a request, delivery information, and frequently asked questions. This entry was posted in Features, News on September 24, 2013 by Sarah Witte. 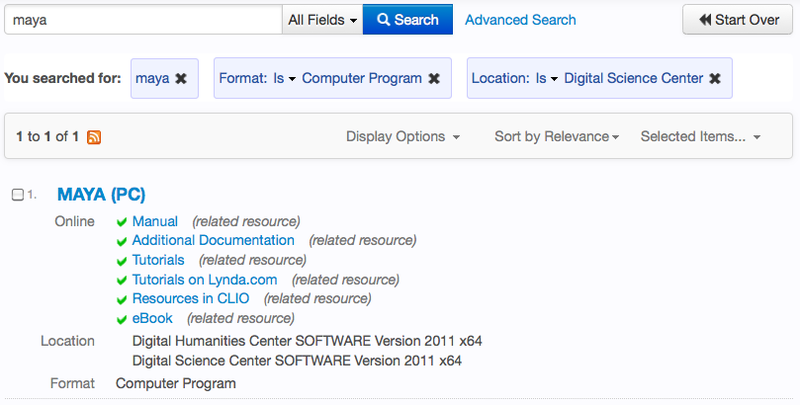 The subject headings in CLIO Catalog are context sensitive. Where you place your mouse will determine how much of the heading is searched. 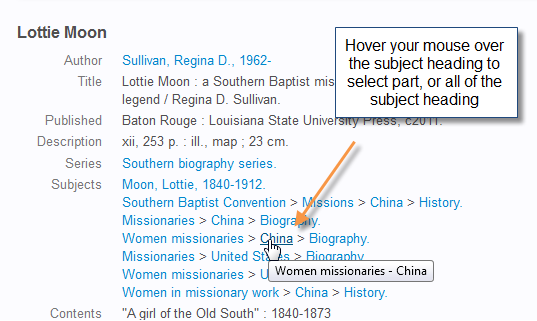 As you hover your mouse over the heading, text will display what will be included in your search. This allows you to be as specific or general as you wish. The headings are always read from left to right, so if you over over the center of the heading, everything up to that point will be searched. Once you’ve searched on a subject heading, you can still add as many subject facets as you wish to your search. This entry was posted in Features, Search Tips on September 12, 2013 by Sarah Witte.